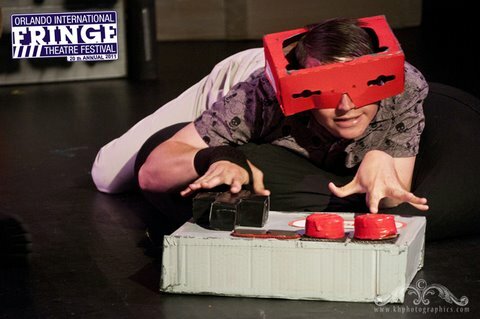 OK, I’m the first to admit that I was one of the biggest fans of Dog Powered Robot, the three-minute segment of the 2010 Fringe’s Creative Mind Experiment, in which Evan and Christie Miga, their little dog Fisher and a blue cardboard robot conquered a cardboard city. But I’m also the first to admit that I thought it was a long shot for the Migas and Fisher to turn their little snippet of a gag into a 50-minute Fringe show that could stand on its own. With the help of a dozen cast members and easily that many people behind the scenes, Dog Powered Robot nearly conquers the world this time around. 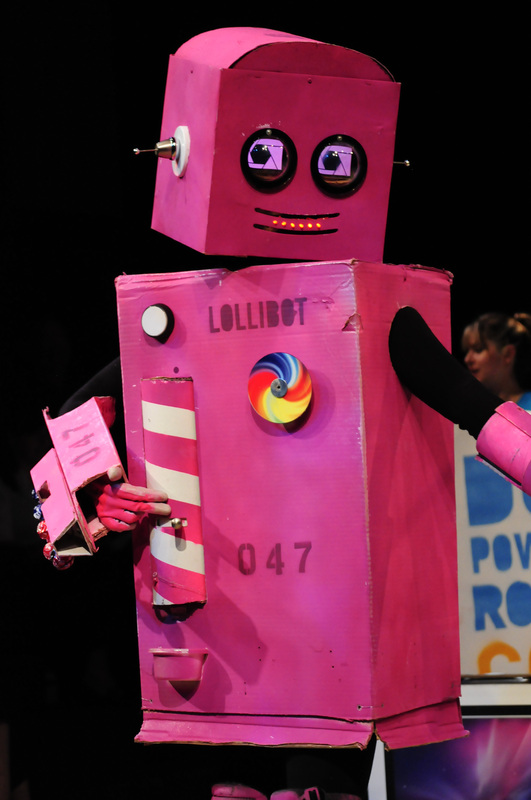 From the moment the pink cardboard Lollibot starts the preshow (with its ominous threats about 70 percent of the audience being harmed), you know you’re in for a ridiculous ride. Dog Powered Robot and the History of the Future (the script is by Josh Geoghagan, with direction by Evan Miga) centers on John Bateman’s Mr. No Bones, a whiny teen with a severe calcium deficiency whose obsession with gaming takes him from wanting to destroy the graduating class of Oppenheimer High School to dreams of larger things. Bateman is a stitch and a physiological wonder as Mr. No Bones, but he’s nearly upstaged by this show’s technological masterpieces — the profusion of robots and projections that populate this corner of the world. images around on the overhead projections), but all the bells and whistles truly amaze. 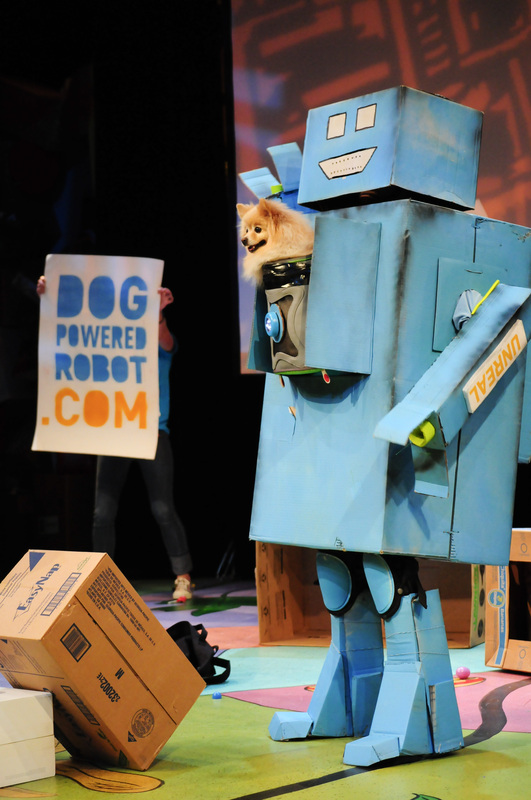 And just when you’re musing that this production will singlehandedly save the cardboard industry, out comes Dog Powered Robot himself, and Fisher Miga steals the show from everybody else. I’m sorry, but I’m a sucker for a little dog in a robot suit. Scoff all you like; Dog Powered Robot will get you too. Sunday May 22, 9:20 p.m.
Tuesday May 24, 5:15 p.m.
Thursday May 26, 7:40 p.m.
Friday May 27, 6:40 p.m.
Sunday May 29, 1:25 p.m.
I’m probably going to be one of the very few who didn’t like this show at all. Maybe I was just too tired, or maybe it’s because I had seen five shows in the very hot green venue already on Sunday. or ….. Sorry folks.